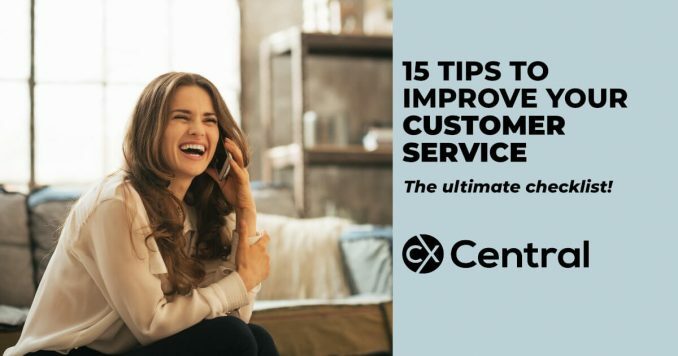 15 tips for improving customer service in your business | Great Checklist! If you run a business its easy to get caught up in meeting deadlines and budgets and trying to find new customers. With customer service now the differentiator between brands and customers tolerance levels for poor service rapidly declining, sometimes you just need to take a step back and look at the customer experience from a different lens. Of course, determining what’s right for your business is ultimately the best approach, but this list is a great starting point for improving customer service for most businesses. So whether you manage the call centre, customer service teams, the website or the marketing team the list below serves as a good checklist! Try your own website without your auto-login. Is it easy? Or a pain? Come in the front door and see if the door swings open easily, or whacks you on the shoulder. And so forth. 2. Do you offer self-service options for your customers? Many customers want them today: unless you’re open 24/7 or at least all conceivable business hours in all time zones in which you have customers, you need such options. And even if you are open round the clock, many times customers today just want to handle it, or at least be able to check up on it, themselves. 3. Do your self-service options include escape hatches? For when the self-service isnt working or the customer isnt in the moodthere should be an easy way out, to reach a human. Make it obvious, like hitting O on the phone. 4. Do your customers have to ask you to answer questions for which the answer should be obvious? Customers dont like to be burdened to contact you for items that could easily be provided for them on a self-service basis. Do your FAQs actually include the questions that customers want the answers to? Or were they written six years ago by your web developer? Do they get an auto-confirmation when they order or do they need to call to ensure their order wasnt lost in the ether? And so on. Are you considerate of your customers time? This is a big, big, big one. A perfect product or service delivered late is a defect. Education is an investment in organisational development. Things will go wrong. Either objectively (whatever that means) or in the eyes of your customer. Either way, you need a plan. Consider my ARFFD approach, for example. The principle of hedonic adaptation means that your hundredth day on the job, naturally will not be as intenseas exciting, stressful, and so forth as the first day. This is good to some extent, but it means that you have to actively strive to remember that this same day is the first interaction your customer has had with your company, and you need to keep your attitude fresh to match theirs. Walk up to, and into, your establishment with the eye of a customer. A customer perception is his reality, and a first impression is important because it tends to linger in a customers memory. Ditto if that first interaction is on the phone, via chat, or via mobile. Of course, there is no before the first impression. But the first impression is very likely happening before you realise it: how youre portrayed online, how your grounds look well before the front door. Disney even obsesses over the route to their parks for this reason. Its so easy when youve completed an interaction with or project for a customer, to rush on to the next one with the next customer. Doing so can erase all the goodwill you created. The goodbye is an important stage, one of the most important, because (like a first impression) it tends to linger in a customers memory. Acknowledge the contributions of individuals and teams with formal and informal recognition. Incentives for your contact centre employees cant replace the general value of hiring people who like people, and treating those people every single day like the professionals who they are. If you sell furniture, dont just benchmark other players in the furniture industry to figure out how fast, easy to use, nice your company should be. come as much from Starbucks, Apple, and other great consumer brands as they do from the others in your particular field.